Pioneer journals speak often of hot springs near the Great Salt Lake. To indigenous peoples these sacred waters bubbling from the earth effected miracle cures. Pioneers, too, believed pungent sulfur springs had medicinal benefits. Bathers flocked to hot springs resorts by the hundreds or thousands seeking help for psoriasis, rheumatism, or diabetes. Recently I found myself wondering, where are these hot springs today? I live in Salt Lake, so why have I never seen them? I assumed that if these springs still existed, they would be resorts or parks or national monuments. A little research revealed my assumption to be naive. Many of these springs are now diverted by underground pipes for commercial use. For instance, Beck’s Hot Spring at the north end of the valley once filled a large shallow lake called Hot Spring Lake. In 1849 Brigham Young spent $6000 to build a public bath house there. In 1860, Richard Burton described “curls of vapor ascending” from “The Lake of the Hot Springs—set in a bezel of emerald green.” Thomas Bullock compared it to the biblical Pool of Siloam. But fires repeatedly destroyed the bath house, and in 1915 the Board of Health drained Hot Spring Lake because it had become a breeding ground for mosquitoes. In 1951, new Health Department regulations requiring swimming pools be chlorinated led to closure of most hot spring resorts in the state. Beck’s survived two more years until the state claimed the land to build a new highway in 1953. Today, the orifice of Beck’s Hot Spring “is confined in a concrete box beneath the south bound lane of Beck Street and the spring discharge flows west through a series of drainage tiles and open ditches into the Jordan River. Hot Spring Lake no longer exists.” Some of the sacred healing water is used to wash sand and gravel from a nearby pit mine. 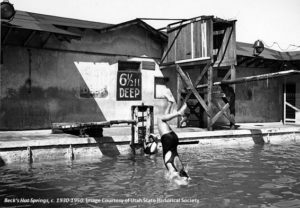 The fate of Beck’s Hot Spring is sadly typical of Salt Lake Valley springs. However, I did find a few that still have surface expressions! Yesterday I went hot springs hunting and located a few of these obscure, hidden gems, all out of the way and none listed on Google Maps. I took photographs and detailed notes on their locations so you can find them too. Let’s make Salt Lake Valley Hot Springs great again! 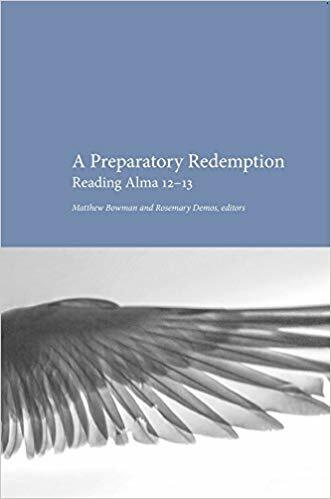 I have a new essay out in A Preparatory Redemption: Reading Alma 12-13, edited by Matthew Bowman and Rosemary Demos, which was just published by the Maxwell Institute this month. It has been my experience in dialoguing with Latter-day Saints that my LDS friends tend to see the most similarities between their priesthood and the Roman Catholic system of priesthood in that both priesthoods are linear (purportedly stretching back to the church Jesus founded) and exclusive. They are less inclined to see analog between their priesthood and the Protestant doctrine of a priesthood of believers. Furthermore, the LDS priesthood as it is currently taught and practiced tends to be assumed in the text of Alma 13.
. . . Alma 13:4 seems particularly concerned with establishing that there has been no unfair treatment of nonpriests . . . Historically, the concern raised in Alma 13:4 has been broadly justified. In order to explain why whole classes of people have been excluded from the priesthood, these classes have been consistently slandered. Highly negative theories have circulated about the groups in question. In LDS history, for instance, the now-discarded theory that blacks of African descent were less valiant in the premortal existence is one example of a theory that places the blame for nonordination on the actions of an entire race. And, in broader Christian history, early church fathers and other Christian leaders have regularly taught that women should not be ordained because, as a whole, women were naturally more susceptible to sin than men. While many Christian denominations have repudiated the idea that women are inherently more sinful than men, and while the contemporary LDS Church has emphatically stated that it “disavows the theories advanced in the past that black skin is a sign of divine disfavor or curse, or that it reflects unrighteous actions in a premortal life; that mixed-race marriages are a sin; or that blacks or people of any other race or ethnicity are inferior in any way to anyone else,” it seems to me that the practice of excluding certain classes of people from the possibility of priesthood ordination still carries substantial risks. It is to the Book of Mormon’s immense credit that, in its only sustained discussion of priesthood (see Alma 13:1-20), the text is so sensitive to these risks. This represents the first essay by a non-Mormon in the Mormon Theology Seminar series. The book is available on Amazon and from third-party sellers and contains other essays by Matthew Bowman, David Charles Gore, Rosemary Demos, Robert A. Rees, Sheila Taylor, Joseph M. Spencer, and Adam S. Miller. Kristeen L. Black was a participant at the 2016 Mormon Theology Seminar, but her essay does not appear in this volume. You can read her essay, “A Capacious Priesthood and a Life of Holiness,” in Dialogue: A Journal of Mormon Thought 50.3 (Fall 2017), p. 73-88. The Eastern Orthodox priesthood is similarly linear and exclusive, but my LDS friends tend to be less aware of Eastern Orthodoxy. Foundational Texts of Mormonism: Examining Major Early Sources, edited by Mark Ashurst-McGee, Robin Scott Jensen and Sharalyn D. Howcroft (Oxford University Press, 2018) reviewed by Clair Barrus. In determining the scope of their book, the editors of this collection of essays defined “foundational” in two senses, the foundational period of Mormonism through the life of Joseph Smith, and the major sources that inform historians when studying this period. The goal of the editors of Foundational Texts was “to provide a deeper level of understanding of these sources so historians and other scholars can use them more critically.” (p.2) I believe the editors succeeded in their objective. On the 2nd anniversary of what has become known simply as the “Policy,” or sometimes the “Exclusion Policy,” I wanted to post stories of how it affected people. Shortly after news of the policy began circulating, I began collecting reactions as they were posted to social media, blogposts, news stories, or shared with me. 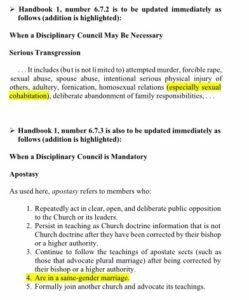 The Policy, in short, defines gay couples (married or not) as apostates, and suggests church disciplinary action. It also bars the children of gay couples from being baptized, or if already church members, further advancement with their peers. Upon age 18, baptism or advancement (such as going on missions, or to the temple) requires children of gay couples to disavow gay marriage. I am including only stories from the month of November, 2015, although I collected many more. I believe that everyone should keep in mind the results of the Policy at ground level — the human element — regardless of one’s opinion of the merit of the policy. 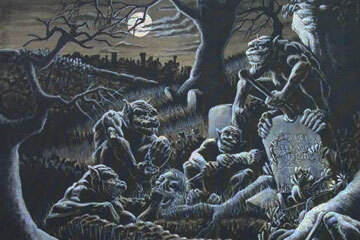 Here I sit waiting for ghouls and goblins to manifest at my door with their insatiable demands for sugar-laden lucre. And while I await my ghoulish doom, I feel compelled to respond to perhaps the biggest ghoul of them all, Daniel Peterson (lest anyone think I am being serious, I am not. I like to believe that Dan and I are jovial enough towards each other to be able to kid around without offense. I’m actually quite fond of brother Peterson, shocking as that may be to some). This cryptic command reveals the earliest stage of the textual history of the Book of Isaiah. The author had disciples, with whom he deposited his teachings for the future, and continued in silence, waiting for Yahweh. Isaiah became a prophet emeritus. It appears that this verse inspired Waiting for Godot, the 1949 play by Samuel Beckett. Here Beckett turns the verse into an existentialist metaphor. There is a tone of both resignation and distant hope in waiting for God. No metal plates from the eighth century BCE containing words of Isaiah have ever been discovered. Thus, the Book of Mormon and the Brass Plates of Laban were precisely what the audience of the Book of Mormon would have expected—the word of God on metal plates to Restore what was lost. The Book of Mormon relates the story of Lehi, a contemporary of Jeremiah, who leaves Jerusalem for America with a set of Brass Plates, containing prophetic writings, including a version of our current Book of Isaiah. 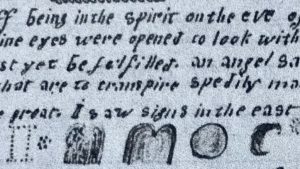 I argue here that the records that serve as the source of the text of Isaiah in early Mormon scriptures were not Gold Plates or Brass Plates, but rather Paper Plates—texts that served as sources of prophetic creativity in Joseph Smith’s rereading of Isaiah. I say “rereading” because neither these Paper Plates nor Joseph Smith’s prophetic midrash contain an original text nor the authorial intent of Isaiah. The Paper Plates from which the early Mormon text of Isaiah was drawn were the King James version of the Bible, the Septuagint in English (LXX), the Isaiah Targum, and nineteenth century biblical commentaries. Early Mormonism used these Paper Plates as part of Mormon midrash, as a new modern rereading of Isaiah for a modern audience. This prophetic midrash changed the text and thus interpreted it in new creative ways for its audience at the end of the world. This rereading can be described as Christocentric, apocalyptic, and Restorationist. Above all, it was an excellent marketing strategy for a populist religion against learned professors of religion. 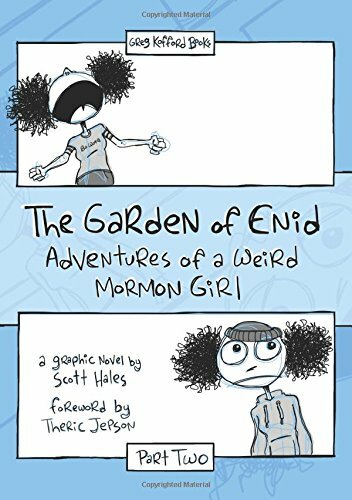 Review of Scott Hales, The Garden of Enid: Adventures of a Weird Mormon Girl, Part Two (Salt Lake City: Greg Kofford Books, 2017). I often feel like a fraud when it comes to the world of Marvel, DC, and others. I rarely read comic books as a kid. Granted, I would skim through some at various book stores and a couple of my friends had them. For example, a good friend of mine during the elementary years introduced me to The Death of Superman and Batman: Knightfall. I think I even recall a few Aliens issues. I had a copy of Spider-Man #34 (1990) titled “Vengeance: The Conclusion.” It was the finale of a trilogy. I never read the first two installments. Still haven’t. And much like Spidey in the issue I owned, I have no idea who the Master of Vengeance was. My main source for the characters and stories of comic books was television: X-Men: The Animated Series, Spider-Man: The Animated Series, Batman: The Animated Series, and (to a lesser extent) Superman: The Animated Series and The New Batman Adventures. It wasn’t until my mission that a fellow missionary and cinephile introduced me to the wonderful world of graphic novels and comics (well, as much as he could while on a mission). It was there I learned about Batman: The Killing Joke, The Walking Dead, and others. While I’m still not much of a comic reader even now (though I did hit up Civil War and Wolverine: Old Man Logan in anticipation of the movies), these friends did introduce me to a new format of artistic storytelling. 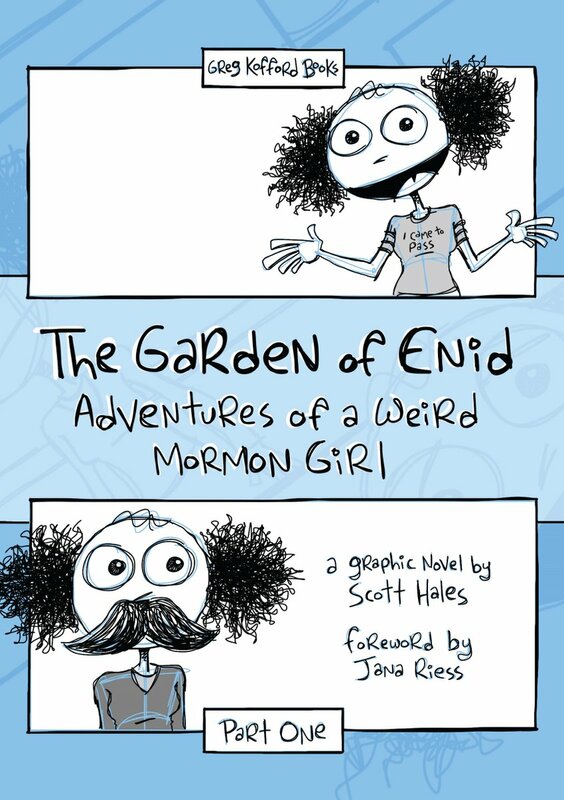 Review of Scott Hales, The Garden of Enid: Adventures of a Weird Mormon Girl, Part One (Salt Lake City: Greg Kofford Books, 2016). When I was still in elementary school, I used to remove the “funnies” every Sunday morning from the paper in order to read the latest strip of Bill Watterson’s Calvin & Hobbes. My love of Star Wars combined with a steady diet of the Sci-Fi Channel provided by my dad–including Star Trek: The Next Generation, Star Trek: Deep Space Nine, Star Trek: Voyager, Quantum Leap, Sliders, Stargate SG-1, and so on–led me to develop a love for the character Spaceman Spiff. These specific strips were pretty rare, so any time they were in the paper I would cut them out and keep them in a folder. I can’t answer as to why I did this exactly. It was probably akin to director Joel Allen Schroeder in his documentary Dear Mr. Watterson who plastered his childhood room’s wall with C&H strips. Nonetheless, I did it. And I treasured those strips for a long time, trying my best to keep them wrinkle free in an everyday school folder. I was devastated when the paper stopped running the strip (Watterson’s final C&H strip ran in December 1995). Sometime after the final strip, I received The Calvin & Hobbes Tenth Anniversary Book as a gift. It was the first in what became my 5-book collection and features an introduction by Watterson, which discusses the transition of comics, his influences, the constraints of Sunday strip formats, an explanation of the recurring characters, etc. But the best part is his commentary on the various strips, no matter how brief. For example, the strip where Calvin breaks his dad’s binoculars features this insert from Watterson: “I think we’ve all gone through something like this story. You die a thousand deaths before you even get in trouble.” Comments like this give us a peek into the genius behind the art. They also remind me why I love Calvin & Hobbes. The writing is full of nostalgia, wisdom, practicality, imagination, and, obviously, humor. And yet, it is very much rooted in everyday life. I’ve heard people wonder what relationship there might be between the Church’s policy banning gay couples including their children from the church, and Brigham Young’s ban against blacks holding the priesthood, including access to the temple. I thought I’d look into this to see what parallels might exist. “If they [the couple and child] were far away from the Gentiles they wo[ul]d all have to be killed[.] [W]hen they mingle seed it is death to all. Worlds Without End is pleased to welcome guest blogger James Egan to the WWE family! 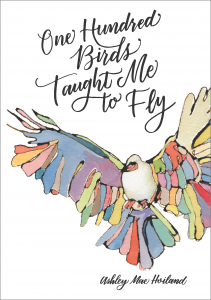 Ashley Mae Hoiland’s new book One Hundred Birds Taught Me to Fly is the newest installment in the Maxwell Institute’s Living Faith Series. I was a big fan of the series already, and Ashmae’s book only improved it. Like the other books, it ably reveals how familiar parts of Mormon faith and practice shine with a light we have forgotten or perhaps overlooked. But One Hundred Birds also stands out in some really significant ways.